Sora CV Blogger Template is a premium tool to promote yourself. Ready to look stunning on any device from a widescreen monitor to a mobile phone. 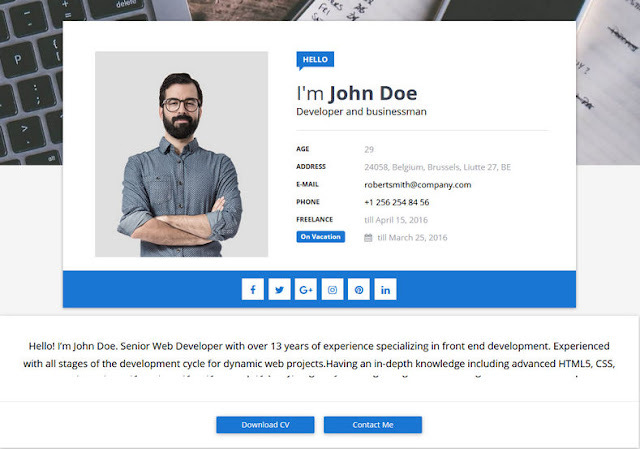 Sora CV is an Ideal theme for any type of profession as for creative studios and companies, perfectly suits for placing information about your experience, skills, services, education, works, awards, expertise, clients, testimonials and pricing. Clean, modern and organised looking material design and well commented, flexible code. We have also included a documentation folder to guide you through the code. We have covered all the important questions but if there is something that you would like to know then we will happy to help out.